The key to designing a passive solar building is to make the most of the local climate by performing a precise site analysis. The elements to be considered include the placement and size of the window, and the type of glazing, thermal insulation, thermal mass and shading. Passive solar design techniques can be applied more easily to new buildings, but existing buildings can be adapted or adapted. The laws of thermodynamics play a fundamental role in this aspect since the transfers of heat and temperature are the basis of passive solar energy. The main difference is that in active solar energy there is a process of energy transformation. Through photovoltaic panels we transform solar energy into electrical energy or through solar thermal panels we transform solar energy into heat energy. Passive solar energy are the techniques that allow solar energy to be harnessed directly without having to process it. For example, depending on the architectural design in building construction, natural energy use can be considerably improved. Passive solar energy uses components such as the construction of walls, floors, ceilings, windows, exterior construction elements and landscaping to control the heat generated by the sun. 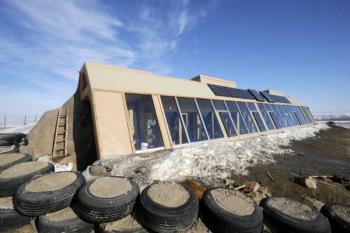 The solar heating designs try to trap and store the thermal energy of direct sunlight. Passive cooling minimizes the effects of solar radiation through shading or the generation of convection air currents of ventilation. An important aspect in the design of buildings for the use of passive solar energy is to know how to manage the flow of air currents inside the building to capture heat in winter and dissipate it outdoors in summer. Natural lighting, and passive heating and cooling are the main solar concepts. A good architectural design also allows us to improve natural lighting. A commercial building can reduce your electricity bill by using natural light. It will create a pleasant atmosphere and reduce the costs of air conditioning, because it is also considerable the amount of heat generated by the bulbs and loas artificial lighting sources. Passive solar energy is characterized by its low cost for the realization of its work. Sometimes, this cost is even nil. The maintenance cost is very low. During its operation, no greenhouse gases are emitted. Despite this, work continues to improve the yield and economic benefits. This does not prevent that it is necessary to continue working optimizing the systems to obtain a greater yield and economic benefit. The savings and efficiency in energy consumption depend on the size of a facility (either renewable or conventional). These criteria result in greater economic benefit if they are criteria that are considered from the beginning. Passive solar technologies offer significant savings, especially in space heating. Combined with active solar technologies, such as photovoltaic solar energy, they can also become an excellent source of income. Systems to be taken into account for the transfer of heat in a passive solar energy installation. There are three types of thermal transmission: by conduction, by convection and by radiation.